Let’s take a peak into what we should or shouldn’t do on social media for 2014. From Facebook to Twitter and Flickr to Pinterest, every network is different in every aspect imaginable. Naturally, moving around each and every single one of them requires a different approach. So how about a visual tour inside every social network, and how you should deal with it? The following is a great infographic by MagicLogix, which we will break down for you (the full infographic is available at the bottom). This is the most important aspect of every business page. If you aren’t socializing on social media, you are doomed to fail. 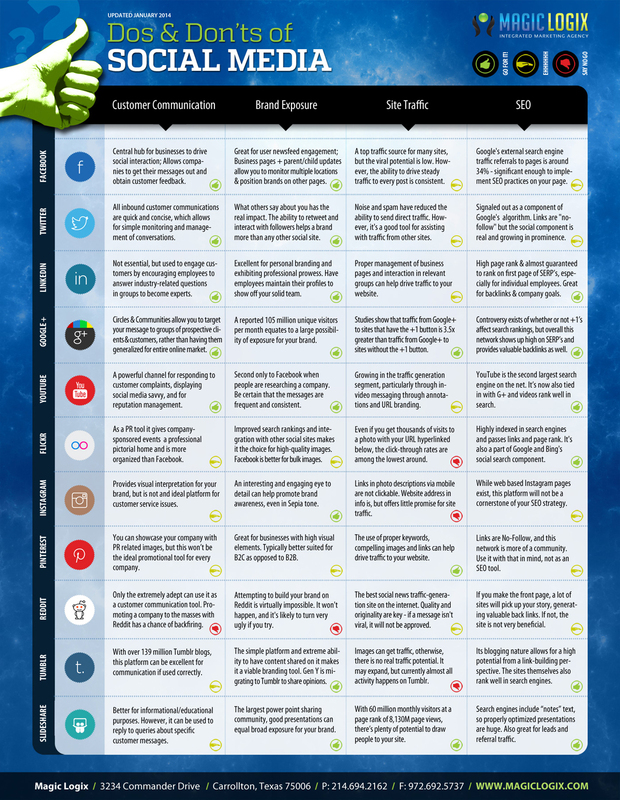 Check out how you should treat customer communication on each social network. If you aren’t socializing on social media, you are doomed to fail. Noteworthy: YouTube offers a multimedia-super-interactive way for awesome customer support. Next time someone asks why your company’s bananas are yellow, make a video. Exposing your brand on social media pretty much follows a universal rule: be social. However, how you approach that rule differs between platforms, due to the users interacting in different ways and for different reasons. Exposing your brand on social media pretty much follows a universal rule: be social. Noteworthy: Instagram can expose your brand in surprising ways. Be creative, even in Sepia. You know what’s cooler than a great online presence? Traffic. Traffic can increase your site rank, expose your brand even more and provide an outstanding reference for online interaction. You know what’s cooler than a great online presence? Traffic. Noteworthy: Google+ is bound to Google search (name familiar…hm). Studies show that a great presence on G+ can boost your website’s traffic up to 3.5X times. 2nd Note: I will soon make the case of the +1 button, on WeRSM, so stay tuned for in depth analysis. SEO stands for Search Engine Optimization. It is commonly known to be of critical importance for websites, however, various studies, including the infographic below, show that being present on social media can boost your stats even higher. Did you Know that Social Media can Boost your SEO? Noteworthy: Pinterest has virtually 0% link-follow. Bare that in mind when you pin your brand. May the Force be with You. Here is the full infographic from MagicLogix.